^ "TicketMakers.com WHOIS, DNS, & Domain Info - DomainTools". WHOIS. Retrieved July 13, 2016. ^ "Comcast is buying Dreamworks in a $3.8 billion acquisition". Washington Post. Retrieved May 1, 2016. 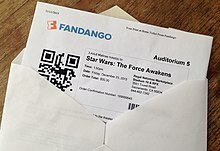 ^ "Comcast's Fandango Buys Online Ticket-Seller Cinepapaya". Fortune. December 1, 2016. Retrieved December 3, 2016. ^ Barnes, Brooks (December 4, 2016). "A Movie Ticketing Start-Up Hopes to Fill Empty Seats". The New York Times. ISSN 0362-4331. Retrieved March 16, 2017. ^ "Atom Tickets Lobs Bomb at Fandango, MovieTickets.com". www.bizjournals.com. Retrieved March 16, 2017. ^ "FandangoNow.com WHOIS, DNS, & Domain Info - DomainTools". WHOIS. Retrieved July 13, 2016. ^ "4K Ultraviolet Headaches: How & Where To Redeem Digital Copies in 4K UHD | High-Def Digest". www.highdefdigest.com. Retrieved December 10, 2017.